The odd thing is that over the years I somehow have managed to acquire a total of 11 Fujix DS-515's. That means a minimum of 81 examples were produced, based on a sample size of 17. Therefore, we can probably estimate that the actual production number was somewhere around 100, provided there wasn't a large set of "demo" or "alternate market" units (with higher or non-standard serial numbers) that have been hidden thus far. This suggests that I now own about 10% of the entire production run of this particular camera model. Weird. Now I feel like a villain in an Underdog cartoon. "I'm going to get all of the Fujix DS-515's in the world! And everyone will have to come to *me* to get their precious Fujix DS-515's! Ha ha ha!" The seller claims "condition is like new,' and does not point out any particular flaws, but look carefully at the pictures and you'll see this camera suffers from the "missing shutter button/collar" problem common to these cameras. You'll also note that there is no "top-side" view of the camera, which would make this flaw far more obvious. E3 8300090 (eBay) - typo? same unit as below? Thanks for your effort Jarle. I've just added to my collection a Fujix DS-560 (E3-equivalent) like new in box (with papers & manual). Its serial number is 8200092. Unfortunately, this set didn't come with charger or battery, so i still can't power it up yet. Besides the D1's charger which can charge E3's battery, appreciate any info on this E3's battery, charger or heir substitute? i wish to power it up either by battery or charger (which seem hard to find now). Thanks. Well, there is no 3rd party battery. No one ever made one for this series. So, all you can do is keep looking for a Nikon or Fuji battery pack. Expect to have to rebuild it once you do find one. Keep in mind that while it fits and powers the E3, the E2 battery does not charge with the D1 charger. thanks a lot, this means I can also find the E2's battery to power up my E3. Nice, more options for me! Seller says he has another. 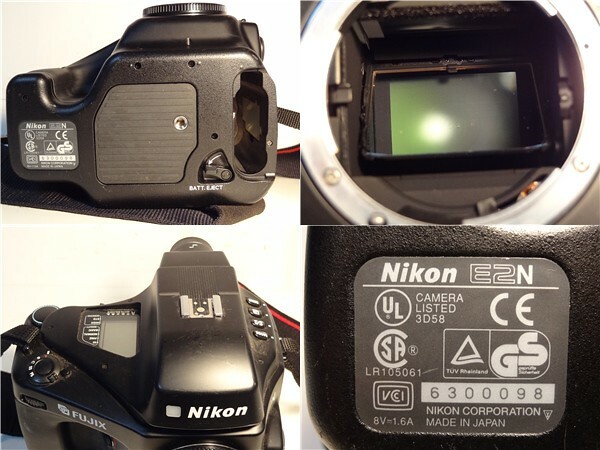 I just saw a Nikon E2N on eBay, serial 7200064. BiN 500 USD with Fujix 15 MB card and a battery (no charger, and untested due to no charger).